Children's day is just around the corner! Want to try something new to surprise your kids? 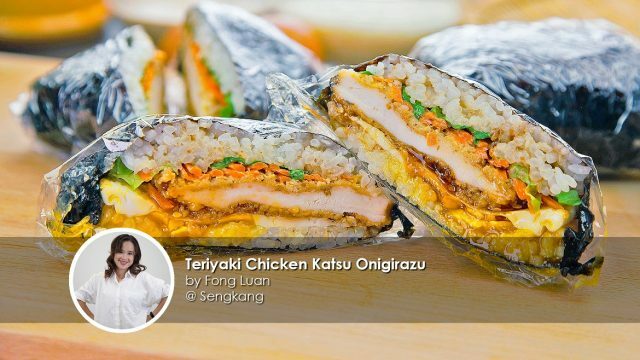 The Teriyaki Chicken Katsu Onigirazu - part burger, part sushi - is a fuss-free and mess-free recipe that will put a delightful smile to the face of your kids! 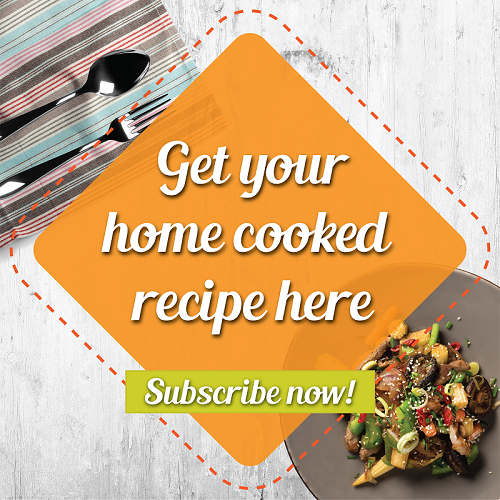 The kids have been working hard at school and now it's time to show your appreciation by rewarding them (and yourself) with a home cooked meal made with love! This Japanese sandwich snack may look simple on the outside, but the combination of flavors hidden in each bite certainly pack a punch - its guaranteed to leave your children happy and satisfied! Want to try something new to surprise your kids? The Teriyaki Chicken Katsu Onigirazu - part burger, part sushi - is a fuss-free and mess-free recipe that will put a delightful smile to the face of your kids! Butterfly the chicken breast in half. Lay a cling wrap on the chicken and pound it flat to equal thickness. Transfer the chicken to a plate. Rub salt, pepper, paprika and minced garlics on both sides of the chicken meat. Marinate for at least 30min in the chiller. Preheat the oven at 180 degree Celsius for 10 mins. Line the baking sheet with baking paper. Coat the marinated chicken meat in the flour, pat off the excess flour. Then, dip the chicken into the egg mixture and finally coat with the toasted panko. Press the panko flakes to make sure that they adhere to the chicken. Lay it on the baking sheet. Bake the chicken breast for 10 minutes, until it’s fully cooked through. Once it’s baked through, let it cool down to room temperature. Lay a cling wrap, dimension bigger than the seaweed sheet, on a chopping board. Lay seaweed sheet in the centre. Add a thin layer of sushi rice, make it into a square shape. 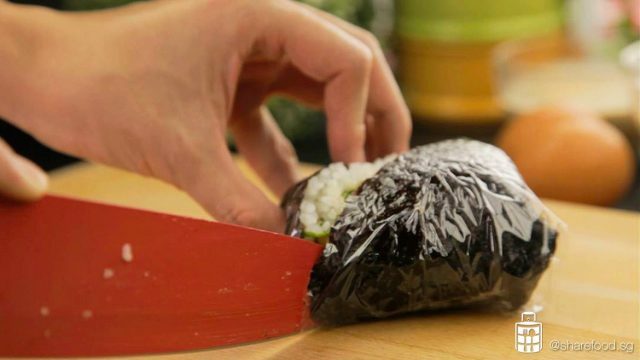 Wrap the onigirazu tightly and set aside for 5 mins before cutting. Cut the onigirazu with a sharp knife. Run the knife in cold water before cutting so that the cross-section will be clean. If you plan to make ahead of time, wrap the onigirazu with kitchen towel and keep it in the chiller overnight. The towel will prevent the rice from getting hard from the cold air.